Tinkerbell Blu-Ray Combo - Possibly as Low as $1.99! 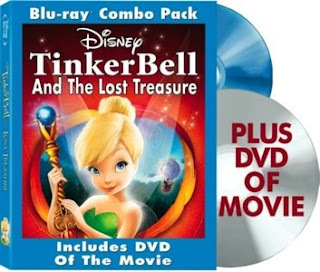 Tinkerbell Blu-Ray Combo – Possibly as Low as $1.99! It has been reported that Best Buy has the TinkerBell Blu-Ray Combo set marked down to $16.99 (this sale is unadvertised, so I am unable to personally confirm it). Here is how you can get it for as low as $1.99! 1. Head over to Disney Movie Rewards and sign into your account. If you don’t have an account, you can go ahead and create one. 2. After you are signed in, input the code GIFT in the points box. A window will come up and you will see a banner that says you can get a $10.00 coupon for TinkerBell. Click this and print it out. You will then need to purchase one or two other items and submit for a rebate. (Remember – don’t purchase anything JUST to get $5.00 back — do it only if they are products you need or use). 3. Purchase 2 Kernel Seasoning Products and complete/mail the rebate form here. 4. Purchase a Leapfrog TinkerBell Book or Game and mail in the rebate form here. Note that this one will allow copies of your receipt to be mailed in. Now, it has been reported that some of the movies have two UPC codes that you can remove from them and if that is the case, you could actually submit BOTH rebates (since one doesn’t require the original receipt) and you could actually end up MAKING $3.00! !